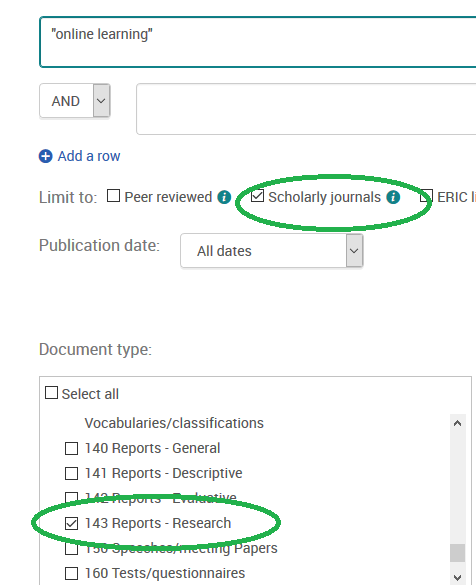 ERIC - in document type, limit to "Reports - Research"
PsycINFO - in methodology, try limiting to "Clinical Case Study," "Non-Clinical Study," or "Empirical Study." Education Source - in document type, limit to "Case Study"
Auerbach, S. (2010). Beyond Coffee with the Principal: Toward Leadership for Authentic School-Family Partnerships. Journal of School Leadership 20 (6): 728-757. Title in Library OneSearch. Use the article title - Beyond coffee with the principal: Toward leadership for authentic school-family partnerships - not the title of the journal (Journal of School Leadership). Journal Title in the Library Catalog. Use the title of the journal - Journal of School Leadership - NOT the title of the article. The results of both searches indicate that the University Library has access to this article online.